Getting ready to install your TV or want to hire a professional TV wall mounting service to get the job done? This guide covers everything you need to know, from different wall materials and TV types to safe techniques and equipment you’ll need on hand. That way, you can get started or book a TV wall mounting service confidently because you know exactly what needs to happen. What Kind of TV Wall Mount Do You Need? It depends on the shape and size of your TV, where the VESA holes are located, and what features you need for your space. Some TV wall mounts have features like tilting and swiveling, while others are fixed in place. No matter what wall surface you’re working with, there are a few steps that you’ll almost always need to follow (with a few variations). Start by following these steps, then keep reading to find out the variations we recommend for your wall type. Step 1: Find the studs (and electrical wires). Usually a stud finder is the best tool for the job. Mark these with a pencil so you know where you can drill your holes. Depending on your wall type, you’ll need to make sure you drill into the studs because you’ll need to support the weight of your TV and bracket. Step 2: Position your wall mount. Ideally, place your wall mount over the top of the power point and TV wall point to conceal all the cords. Hold the bracket level (use the level) and match the cut-outs in the bracket with the studs you marked out with a pencil. Mark the spots where you’ll screw the bracket into the wall with your pencil. Step 3: Make the holes. Use a drill to drill the hole on each pencil mark. Step 4: Install the bracket. Get a friend to help hold the bracket. Use a wrench to screw your bolts (with washers) into each hole, holding the bracket in place. Keep the bolts loose until they’re all in place, then tighten at the end – just in case you need to re-do anything that’s not quite right. Step 6: Plug in your cords. You’ll need to plug everything in now because once it’s hanging on the wall, it’ll be really tricky (of course, this will depend on what type TV bracket you go with). Step 7: Set the angle. Move the brackets to the desired angle, then tighten the nut on the side. Step 8: Mount your TV. Get a friend to help you lift the TV onto the wall and connect the part of the bracket that’s screwed into the wall with the wall mounting plate that’s screwed onto the back of your TV. Tighten the screws from underneath to lock it into position. Step 9: Finish off the job. Clean the TV to remove any fingerprints and vacuum up the dust from your drill. If you installed your TV a slight distance away from the power point and TV wall point, you’ll also need to hide the cables with a cord cover. All done! Now you can enjoy your freshly mounted TV with better viewing than ever before. Of course, the above instructions are quite general in nature. Your TV wall mounting service provider will adapt their method depending on your wall type and studs. We’ve included some tips for different wall types below. Follow the steps above, ensuring your bolts screw into the studs behind the wall for added strength and stability. You can mount your TV on wood paneling. If the panels are thick enough (at least 7mm thick), you may be able to drill directly into the panels without needing to also go through wall studs. However, if your wood panels are thin or you have a heavier TV, you’ll need to find the studs and proceed with the instructions above. Remember, even if you don’t need the wall studs, you’ll also need to consider other elements of your internal wall, like plumbing and electrical cables. Follow the same instructions as above, except you won’t need to worry about studs or internal wall parts because the bricks/concrete should be able to fully support the weight of your TV. Just make sure you use appropriate bolts and drill bits for these materials and ensure they reach far enough into the wall. Then when it comes to concealing your cables, you’ll need to use cable covers because you can’t hide them in the internal wall. While we’re at it, if you plan to install a TV outside (which is sometimes the case for brick/concrete walls), you’ll also need to consider wind, moisture, and dust. Get a good cover for your TV and if you’re near the ocean, it’s a good idea to consider rust treatments for your bracket. Most homes are built with wood studs. Studs are wooden frames that support your walls and usually run vertically from floor to ceiling. Each wall might have 3 or 4 wood studs spaced evenly apart. Because some wall materials (like plasterboard or gyprock) aren’t strong enough to hold the weight of much more than a photo frame, you’ll also need to go into the wall stud when mounting your TV on the wall. You can use an electric tool to find your studs or manually using your knuckles by knocking on the wall and listening out for where the walls sound hollow (the bits that aren’t hollow sounding are more likely to be studs). To confirm that’s what you’ve found (rather than something else in your wall) mark out several studs and check that they’re evenly spaced apart. Follow the steps above to wall mount your TV once you’ve located your studs. You can also wall mount your TV onto metal studs, but it’s slightly more complex than wood studs. To mount something to a metal stud, you’ll need either a driller toggle, strap toggle, or a toggle bolt. Other than that, you can follow the same basic steps above. By the way, you can find metal studs using the same methods we mentioned above for wood studs – an electric stud finder or manually. Metal studs may, however, be a bit narrower than most wood studs, so you need to be more confident about the accuracy of their location. So double check everything before you get started. Firstly, don’t be tempted to drill straight into the plasterboard to hang your TV wall mount. Even if it can hold the weight of your bracket and TV for a little while, there’s a high risk that both will come falling down at some point and damage your TV (and/or any people and items underneath it). If you can access at least one wall stud, you may be able to use this to attach your TV wall mount. Alternatively, some people use a piece of timber or a solid piece of MDF and attach this to the wall at multiple points, before mounting the TV on the timber – this spreads the weight more evenly. But it depends on your TV size, wall mount style, and the position you want it in. 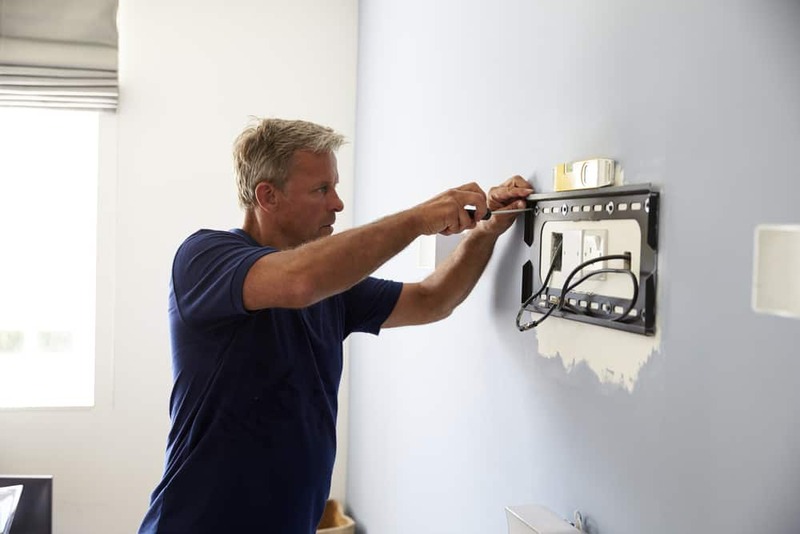 An experienced technician would need to assess your situation as part of their TV wall mounting service before deciding what to do. Are Some Studs Vertical and Some Horizontal? Technically, all studs are vertical. If there’s a horizontal frame between the studs, that’s called “blocking”. You can attach TV wall mounts to either vertical studs or horizontal blocking. Do I Really Need a Stud Finder? No. Although an electric stud finder can make your job a lot faster, you can also find studs manually. Use your knuckle or a covered hammer (to protect the wall) and bang on the wall in different places. Listen for the sound it makes – the hollow bits are the cavities, and the non-hollow sounding bits are most likely studs. Does the Size of The Television Matter for Wall Mounting? You’ll need to find a TV bracket that’s strong enough to carry the full weight of your TV. Check the maximum weight capacity listed with the specs for your TV bracket. What TVs Can Be Wall Mounted? Nearly all flat screen TVs follow VESA standards, which means they’ve got holes on the back in a standardised pattern – easy to match up with a TV bracket. But if your TV doesn’t have these holes, you should still be able to use a universal TV wall mount to get the job done. As you know from reading this guide, there’s so many different steps to get right and a lot of factors to consider for your situation, your TV, and your wall type. Plus, specialist equipment goes a long way in getting the job done properly. Using a professional TV wall mounting service is the safest, most reliable option. Read more in our blog, 11 Reasons To Leave Your TV Wall Mount Installation Up To the Pros. For more details on each of these factors, take a look at our previous blog, How to Prepare For Your TV Installation. Ready to book an experienced professional to come and install your TV? To book your TV wall mounting service or get a free quote, call 1300 800 123. We look forward to helping you get set up sooner so you can enjoy your favourite shows in maximum comfort and style.